operating in the frequent gales in the area. 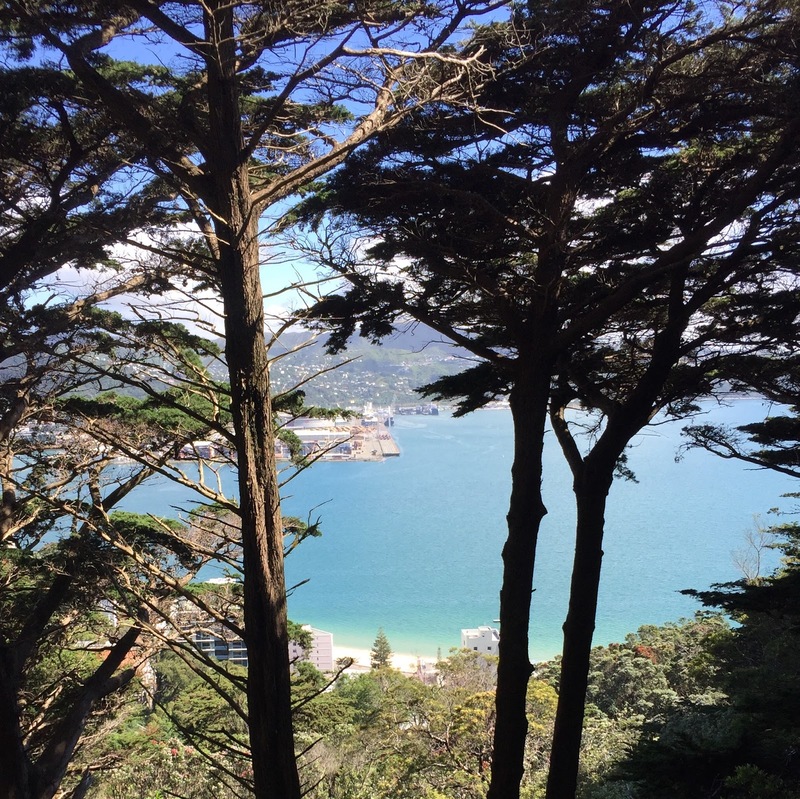 Since most kiwis take an extended break at the start of their summer (Dec-Feb), which coincides with the end-of-year festivities, we decided to play kiwi and enjoy some time away from the city. 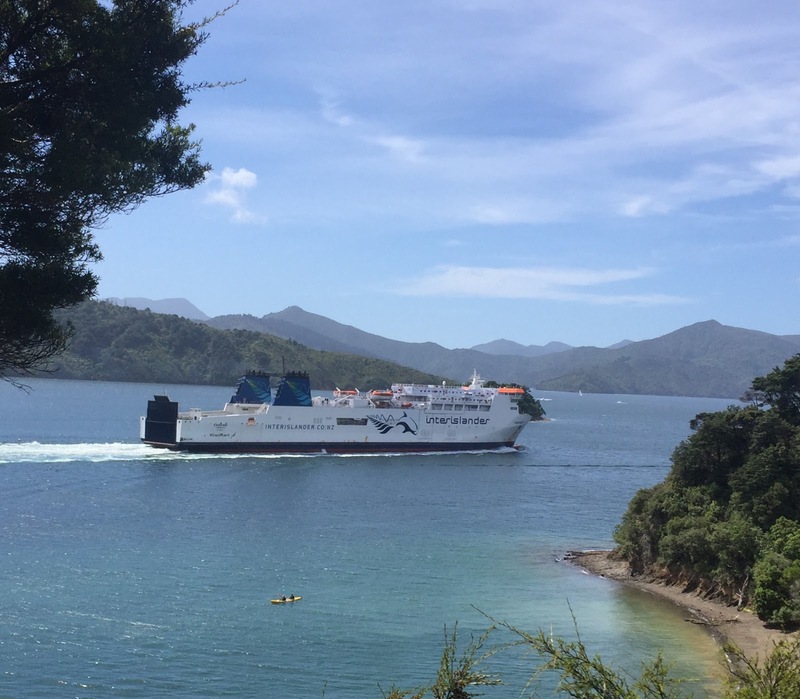 Because we don’t have a car, we pieced together public transportation to take a peek at the South Island: flight to Wellington (the capital), then ferry across Cook Strait to the Marlborough Sounds in the northwest tip of the South Island. Nicknamed “Windy Welly”, Wellington is officially the windiest city in the world. Kiwis who live here love it and don’t seem overly bothered by the regular gale force winds. When asking whether those winds are maddening (we are used to Boulder Chinook winds that make everyone pissy cuz no one can sleep at night), kiwis just shrug and tell you you get used to it, though occasionally an older person is thrown to the ground and breaks a limb, that's all. Kiwis are tough people. Speaking of crazy mother nature, we missed the opportunity to experience a 5.5 earthquake that happened in the area. Our airbnb host and landlords were so excited for us to have the experience but, alas, we were on a water-taxi at the time. Pity. Somehow I think there'll be another chance. 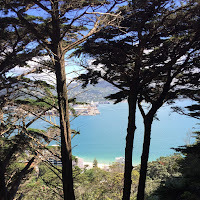 We enjoyed Wellington, which is small (walkable) yet has lots to do: mountain biking and hiking straight from town (and many out of town), a town beach, the museum of New Zealand (free of charge), and Weta Studios. Next time you watch a movie with special effects - Avatar, Lord of the Rings, Contact, etc.. - , notice the Miramar credits at the beginning. I always though that was the California Miramar, but nooooo.... Miramar is the Wellington suburb where the Weta Workshop and 4 other companies dedicate themselves to creating those special effects. Weta is "New Zealand's coolest little monster, a bizarre and prickly prehistoric cricket" but when we toured their workshop, they joked that Weta stood for “We Employ Total Amateurs”, as in anyone obsessed enough with fantasy stuff to want to work here gets the job! Peter Jackson, who hales from Wellington, is building a museum to put many of his movie props on display. Most props are otherwise destroyed since NZ is too small to store them all and they can't be reused because IP protection - except rocks, apparently. No movie director can claim the rocks made for their movies, some of which we learned are made of toilet paper rolls (most are model-sizes)! Wellington also had a few of the Lord of the Rings filming locations, so we had fun trying to locate them and identifying matching movie scenes. 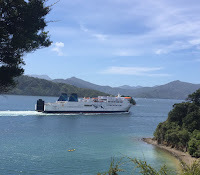 After Wellington, we took the three-hour ferry to the South Island to visit the Marlborough Sounds, which has the famous 3 to 5 day Queen Charlotte Track along one of its peninsulas. What makes this track so popular is the option to stay at lodges each night (with hot showers and dinners with Marlborough wines) and have your luggage schlepped by water taxi to the next lodge so you don’t have to carry a full pack while hiking. Now that’s my type of hiking. You can even opt to kayak a day to rest from hiking, which we did of course. Hiking provided incredible views and the weather cooperated after showing sign of dumping heaps of rain on us. A "day off" hiking means kayaking! While hiking the QCT, we met an Australian couple from Adelaide who relocated to Auckland about two years ago, going against the trend of kiwis moving to Australia to earn “less sucky” salaries. Come to find out Dave works two doors down from Bill in Auckland. Dave is an landscape architect and Felicity is a government policy advisor. Both got a job without issue and they have been adapting to life as kiwis. We learned a lot from them, and plan to reconvene in Auckland. Social life here we come! We learned that we may be referred to YAFAs (Yet Another F*ing Aucklander) when traveling outside Auckland. For my French readers, kind of an equivalent to “parigots” (Parisian visiting the countryside with their accent and ways of being). We also learned that we should buy a car NOW, and not wait like they did eighteen months. We have been struggling with that one - considering Bill commuted everywhere by bike while in Boulder and I grew up with public transportation in Paris. Well, Auckland ain’t Paris nor Boulder it seems. Your kids may be wagging (skipping school). That one gives a whole new meaning to the "Wag more and Bark less” bumper sticker. You get meds and insect repellent at the chemist (pharmacy). When bad weather is coming, the weather is fine until it turns to custard. Don't forget your sunnies (sunglasses). A landslide is just referred to as a slip. It’s all relative when you have earthquakes as a regular occurrence! You can have trim milk (skim) or full cream milk (whole). Reminds me of “butter croissants” - what else would croissants be made of and do you really have to remind me before I indulge and enjoy? Fun sucker…. New Zealand has a very young population. Sometimes we wonder where we fit. Thankfully the humidity softens wrinkles. Quite a few folks came with holiday work visas, which we learned are quite easy to obtain: just need a little youth and enthusiasm. They work for nine months and travel for three. Lucky for me, most of restaurant staff have been young adults from France. We hardly run into any Americans, except our kayak guide from Spokane, WA. Victoria, just outside of Wellington. When you move to another country, you notice how the world is getting more global every day. Two services could really use an upgrade though: video streaming and banking, with phone plans a close third. It took us over a month to figure a legal way to stream movies, each attempt creating bouts of anger at being misled with one solution or another. Amazon, Netflix and HBO really need to experience the pain they create to watch movies in one country from a subscription bought in another country. And banking, well, let’s just say that for the foreseeable future, you need a warm american body to initiate a wire transfer from our US account to our kiwi account. That must be their idea of security. Wow! Google Fi has been serving Bill well - mostly that he enjoys giving out my local phone number instead of his US number, but standardizing the format of phone numbers world wide would be a huge win across the board. Here, mobile numbers come in a variety of formats, none of which look like the land line numbers. The summer is short here, so many work places close shop from Dec 23 thru Jan 9. Consulting work stalled late November and will not pick up until late January. That means we still have a couple of weeks to visit places before everyone comes back from the beach ready to resume work. 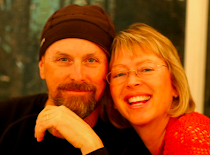 We are happy to report that we finally found tenants for our house in Boulder. After two months of low to no activity, we had to settle with dog owners which likely will destroy our hardwood floors. We would have preferred kids and cats but beggars can't be choosers. Oh well. 2016 has been quite a year - from Spencer's graduation, Shelby's graduation, Alizée's graduation to our NZ adventure. We wish everyone a happy and adventuresome 2017. If you need to practice with wire transfers we can provide you with our bank account number any time. Glad you are getting out and seeing the country and enjoying the summer.